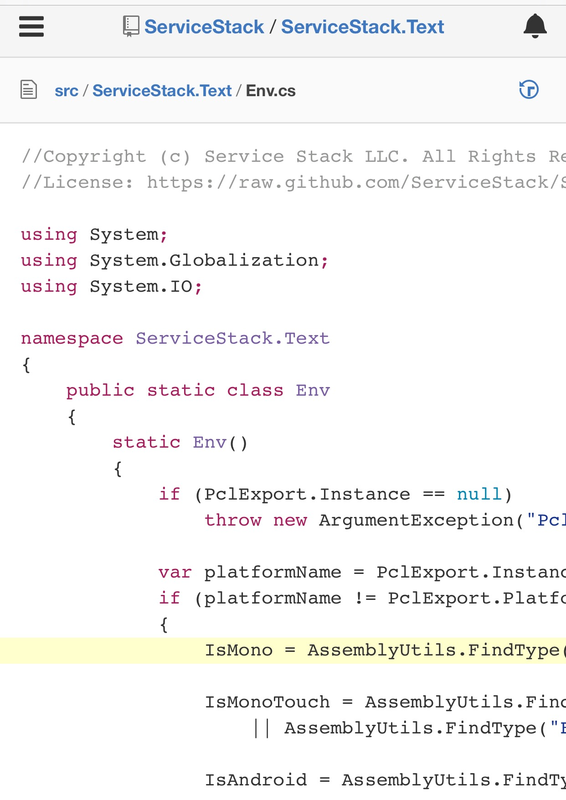 In my last post I tweeted out a link about me using a custom IsRunninOnMono() method and enjoying using the Service Stack library with Xamarin on a Mac to develop on. Well, happily I got a great reply from @demisbellot from Service Stack who pointed out theServiceStack.Text library has an alternative to my my solution baked in. Thanks for the reply @demisbellot! I shall use that later today as it is a much better solution and the base Env. * class has loads of useful methods that I have missed. For reference here is the source code used. Again, this blog post has been written on my mobile phone using the following tools in addition to my Jekyll driven, Git stored and GitHub static hosted website. Its faster to write on an actual computer but it does make coming up with draft blog posts as soon as you have the idea easy. It is really good for taking a screenshot on your phone, using the phones image editing tools then uploading to Amazon S3 then finishing off the blog post when you would normally be checking twitter or social media. I am hoping this will drive me to write more blog posts this year than I did when it was hosted on blogger and eventually my writing will improve with the benefit of more traffic and better SEO. Open Source and contributing to projects is another challenge for me this yesr including releasing some of the projects I have been working on.